People: Perhaps the biggest challenge was finding the right people with sufficient expertise, passion, integrity, and compassion. Our first meeting of leaders in the company, which occurred about a dozen years ago ended in disruption, with arguments and counter-arguments flying. Needless to say, it broke up into a loud generalized disagreement about what our vision and mission should be, what should be the direction we were headed in and what should be our priorities. Over the years it took a lot of effort to bring our executive team together to work as a real team and not in silos. Our biggest focus in the early years, which still continues to this date, was relationship management. Trying to herd professionals who were “A” type personalities with strong views and equally strong experiences was extremely difficult and we often felt that the team would break from the pressure. But, over time, the team not only survived but thrived on the differences and became a strongly- knit fellowship with shared goals and concerns and mutual respect and friendship. Hiring the right people for our work was another challenge since there was a severe paucity in the talent pool in the community. The young generation did not have the skill set nor the emotional quotient necessary to work in medical offices. We had to hire often the young and inexperienced and train them and upskill them over time. We hired from gymnasiums, libraries and community theaters and many of them, over time rose to take responsible positions within the company. Along the way, there were many errors in hiring and we often had misfits in the company. We also realized that often the best way to bring teams together was to challenge them to go beyond themselves, push them out of their comfort zones while working with them with a lot of forbearances and to keep educating and training them. The second biggest challenge was the utter lack of infrastructure in the community, including poor transportation services and no connectivity. We had no great restaurants nor facilities where teams could interact, celebrate, get together or just relax in an informal setting. We had no Starbucks in our early years, nor great public parks nor large convention centers to hold our gatherings. It was difficult to get around this. We tried to develop parallel teams in bigger cities such as Tampa to assist with better internet access and broadband access along with working with programmers in India to strengthen our talent pool and optimize resources. The innovation culture that we were trying to develop took more than a decade to blossom. Working cohesively as a unit, breaking silos to not only work better together, but to be able to challenge each other and grow outside our comfort zones was perhaps the biggest contributing factor to our success. We never took a “no” for granted and did not accept our lack of experience or expertise as a roadblock in our journey towards creating better products and services. Fear of failure prevented several team members from attempting something different. Also, the pressure to create something for our present clients without failing them was significant. 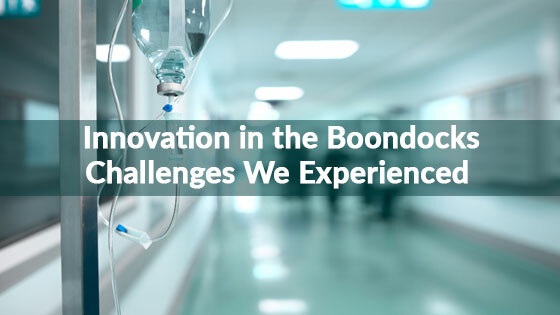 We had to take small steps to ensure that our products did not create hardships for our patients and users and did not risk security or disrupt workflow. This did create some waste of time and resources. Immediate solutions were not necessarily the right long-term solutions and often we had to circle back and revisit our product to improve it which meant duplication of effort. One of the big barriers we encountered was the cynicism and lack of self-belief from our leadership. I remember presenting what we wished to develop for our ecosystem to a team of 40 executives from a Fortune 100 company and the patronizing tone dripping from their voices. None of them understood what we were trying to do except one person who was also a physician. I was told to my face when I said I wanted to do my own EMR,“ Dr. Singh, it is good to dream”. In the face of such widespread negativity, this endeavor became a huge personal risk. Failure would have been blamed on me alone, and that is the uncertainty and self-doubt one had to battle. We had to persist despite all failures and setbacks and keep plodding even though we were advised by far-wiser people that this was a fool’s errand. We had to learn to latch on to faint gleams of hope and successes and keep at the endeavor despite the significant expense of resources, goodwill and doubt. It is only when we had a few small successes when buy-in came from leadership that we grew confident and embarked on riskier adventures. The expense was the other significant constraint on our drive to innovate. Even if one attempts to be thrifty, essentially one is creating a lot of bandwidth when one is trying to attempt something new. That necessitates hiring the best talent or subject matter experts, creating a dynamic culture and environment for them, and providing the right tools to ensure their success. This becomes a Skunkworks like a project. That entails significant costs and one has to plan appropriately for the same. The biggest risk in such a scale-up is running out of funds or needing an investor to bail one out before one is financially liquid. That requires a thinking where one is focused on the immediate impact of one’s investments and return on investment. One may not have the luxury to wait several years to see a return. The innovation approach that makes sense out of this risky business is to create products that are of immediate use in one’s own organization. Thus, you are solving a problem or dilemma for your own organization and then have proof of how it worked for that organization as a selling point for others. The Vast Difference Between Domains: IT and healthcare come from different world-views. They are almost from 2 different dimensions. It took us almost three years to learn (or unlearn) how we could collaborate with each other, understand how algorithms are done and adopt a systemic view as needed to develop a large platform. On their end, the programmers had to work how health care providers often work, intuitively or heuristically, looking at gestalts rather than with a logical thought process even though there does exist a method to the art of medicine. Add to this the diverse cultures from which the health care SMEs and IT experts came and the dissonance at times became unbridgeable. We had phone calls where we could not hear each other, or there was significant static (in more ways than one). Learning to work as a team even though the primary relationship was that of a client and vendor, as partners, was a painful process for both sides. But as communication improved, we also learned how to provide better specifications and scopes for what we wished to develop and not interfere with our hyper-agile mode of working. On their end, they had to understand the unique domain of health care, not to mention managed care and accountable care, our focus on compliance, evidence-based medicine, quality and patient engagement and our relentless drive to improve end-use. We had to learn what Minimum Viable Products are and prototypes are and about iterations and the waterfall method and go-to-market strategy and how to productize (is there such a word?). We had no start-up experience either. Unlike in Silicon Valley where everyone or anyone can create a new venture on the back of a napkin, we had to think through long-term without powerful backers or mentors. We did not know sales and marketing, nor the technical requirements of sellable products or services. We did not realize our own value. When I visited the HIMSS conference last year in Orlando, I was surprised to see Fortune 100 companies trying to sell products far inferior to what we had created for our providers and what we had been using for the past few years. This provided a tremendous fillip to our self-belief and ability to create products for the market. Over time, the relationships and people, and growing experience and failure recoveries became our greatest assets and this all started feeding creative thinking and approaches on their own. Team members started seizing the initiative once they realized what was happening, and to our surprise, we found hardened and seasoned professionals getting excited about children to see their new self-created toys. At that point we realized we had crossed a huge barrier……. we had breached the known boundaries of our systems and now could function in a parallel universe and provide something that no one else had done. We innovated in the boondocks in spite of ourselves and for one another.